For the reasons given below (Reporter Notice of Intention – dated 17 November 2017_482065), I am minded to allow the appeal and grant planning permission subject to the conditions listed below, following the signing and registering or recording of a planning obligation under section 75 of the Town and Country Planning (Scotland) Act 1997, or some suitable alternative arrangement, covering the matters referred to in paragraph 18. The reporter appointed to consider the case, Mr Andrew Fleming BA(Hons) BTP MRTPI, will be carrying out a site inspection of the appeal area on Monday 26 June 2017 at 12:00. Interested parties are welcome to attend. The meeting point is at the site entrance. Please note, that the purpose of this visit is to allow the reporter to become familiar with all the physical aspects of the site and the surrounding area. Although you can point out to the reporter the features of the site that relate to the appeal, the reporter is unable to enter into any detailed discussion about the case. You should also note that this notification does not give any right to enter property or land without first obtaining the permission of the owner. It is likely that after carrying out the site inspection, the reporter will have enough information to make their decision and it will be issued in due course. According to my records, you were consulted by Aberdeenshire Council on the above planning application which is now the subject of an appeal to Scottish Ministers. Any response you may have made will be forwarded to Scottish Ministers and copied to the appellant. Unless your response is withdrawn within 14 days of the date of this letter, it will be considered by Scottish Ministers when determining the appeal. If you have no additional comment to make you need do nothing more. However, if you wish to expand on any point previously made you should do so in writing, within 14 days of the date of this letter, to The Directorate for Planning and Environmental Appeals, 4 The Courtyard, Callendar Business Park, Callendar Road, Falkirk, FK1 1XR, quoting their reference . If at any time you wish further information, please contact me on the above number. Discussions relating to this application lasted for nearly 2 hours. Sir Archibald Grant spoke on behalf of both Cluny Midmar & Monymusk and also Kemnay Community Councils and a local resident spoke on behalf of residents in the immediate vicinity. Councillor Lonchay expressed numerous concerns, which were also supported by Councillor Grant. 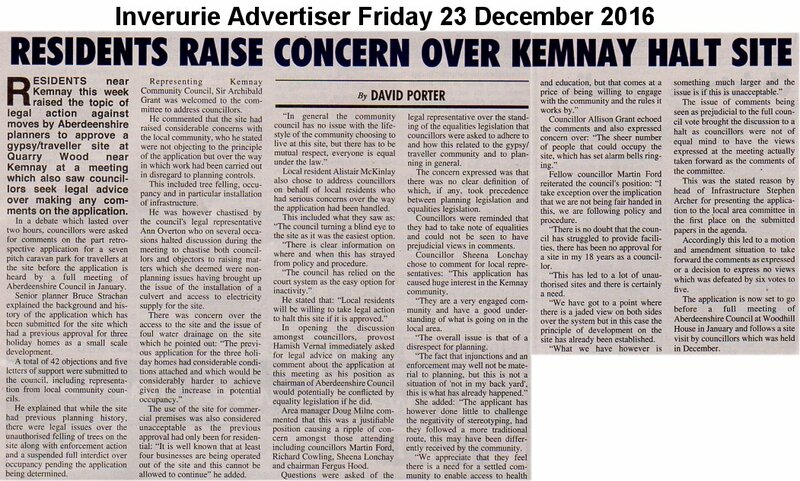 Such concerns included her opinion that Kemnay Community Council’s representations were based on Policy and local opinion and she reiterated that there is no ill feeling or prejudice towards Travellers in Kemnay and if the Travellers had followed normal practise of submitting a bid for the site at the time of the Local Development Plan review then the proposed development may well have been considered in a different light by the local community. She made the point that “inclusion” meant equality for all members of the community. She also made reference to whether the Equalities Impact Assessment should take precedence over the Local Development Plan and continued by referring to other issues like housing need. Councillor Martin Ford thought it would be difficult to refuse the planning application given the existing consent for 3 holiday chalets but considered that there was a case to be made against the substantially increased scale of development, i.e. The original consent was for 3 chalets and now the proposal was for 7 static units plus 2 to 3 caravans per plot which could possibly result in 28 units on the site at any one time. Further debate raised an interesting point about how planning applications should be considered and that at a previous meeting Stephen Archer (Dir. of Infrastructure Services), had intimated that planning applications should be considered on their own merit and not influenced by Equalities Impact Assessment matters. The debate then became somewhat complicated as far as procedural matters were concerned and whether the Committee could in fact express a view to Full Council because standing orders did not appear to allow such. It was eventually decided to propose a Motion to express a “view” to Full Council based on matters of concern raised in Cllr. Lonchay’s earlier address to Garioch Area Committee and to also include Cllr. Ford’s concerns about the scale and impact of the proposals. This motion was duly proposed by Cllr. Lonchay but Cllr. Cowling proposed an amendment that Garioch Area Committee should not put forward any “view” whatsoever to Full Council. There were 12 Councillors present, the outcome was that 5 Councillors voted for the Amendment and 6 Councillors voted for the Motion, so Garioch Area Committee will express a “view” to Full Council based on Cllr. Lonchay’s comments and the additional concerns expressed by Cllr Ford. It should be noted that this is merely a report by a member of the public that attended the meeting. More specific details of Cllr. Lonchay’s concerns that form the basis of the view to be submitted to Full Council will appear in the official minute which will be published one week prior to the full council meeting on 26 January 2017. At the Garioch Area Committee meeting on 29 November, the application was deferred pending a site visit to Quarry Wood commencing at 10.15 a.m. on 09 December 2016. The entire committee of 68 Councillors have been invited to attend the site meeting. Members of the public can also attend but normal protocol is that members of the public are not allowed to make any comments or representations to Councillors or Officials. The application will next be debated at the Garioch Area Committee meeting at Gordon House on Tuesday 20 December when the Committee will formulate a view on the application after first listening to representations from Archie Grant (representing both Cluny Midmar & Monymusk Community Council and also Kemnay Community Council) and also an address by a local resident who has received approval from the Council to speak on behalf of the AB51 5LU post code local area, which represents 6 households. This planning application will now be considered by the Garioch Area Committee in Council chambers at Gordon House, Blackhall Road, Inverurie at 10.00 am on Tuesday 29 November 2016. It is likely that the matter will be deferred pending a site visit on the morning of and prior to the next Garioch Area Committee meeting on 20 December 2016. Whilst the recommendation will be to seek a view from Garioch Area Committee prior to referral to Full Council on 26 January 2017, you should be aware that the Planning Service is supportive of the application and will be recommending it is granted full planning permission. Any person who submitted a valid representation and wishes to speak at committee must submit a request in writing to the Area Manager’s Office by noon on Friday 25 November 2016. All Councillors are very willing to hear comments from anyone with an interest in this application including persons that do not wish to make a comment on line or comment in a manner that would identify them. Any emails should be marked CONFIDENTIAL and must include your name and address. Councillors agree to take telephone calls and the same privacy assurances apply. In the event of any voicemail response, please leave a brief message with your name and contact telephone number. To comply with Data Protection Councillors will ensure your Privacy will be protected. The agenda for this meeting will be published on the Wednesday 23 November and can be viewed HERE or by clicking the link below.